In theory, I suppose, there's nothing intrinsically racist about white people portraying black people with blackface. After all, in Japanese theatre, for example, men often portrayed women. That said, I guess you have to ignore a couple centuries of minstrel shows like Amos N' Andy where people in blackface were usually white people, portraying Negroes who in turn were portrayed as dumb, inept, unable to speak properly, and generally acted like fools while they shucked and jived for the audience. 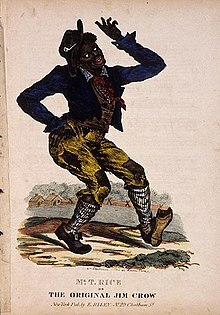 "Jim Crow" is named after a minstrel show character. A white guy, in blackface, acting the fool for the audience. When bottle blondes play dumb. This one is also a really good one for "They're sorry!"